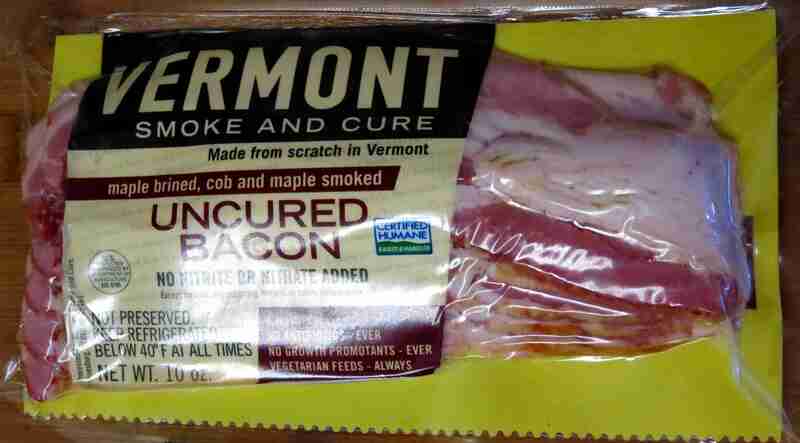 Home » Meat » Bacon » Vermont Smoke And Cure Bacon – Another Bacon Project Post! On a side note: I’m seeing the “Uncured” label on bacon a lot lately. Perhaps I should do a separate post on this. But despite “legal definitions” I am curious how companies believe that calling their clearly cured products “uncured” will improve sales. I mean, anyone who’s buying a top-quality bacon product like this one already knows that ALL bacon is cured, right? So what value is there in calling it “uncured” despite that the idiots in the FDA have decided that there is a minimum requirement for curing salts, smoke time, water left in the final product, or some other silly measurement to call your product “cured”. Anyway, if I decide to go down that road any further, I will write a post on it. IF you want to see a post on it, let me know in the comments!! After cutting it open, I smelled it. The scent was lightly smokey. Despite that it is flavored with maple, the smell didn’t carry a strong maple scent, though it was there if you take several sniffs. It was a very subtle flavor, as was the smell of the meat. The curing process (though it calls itself “uncured”) was clearly different from what I am used to. I cut the slices in half, so that each slice of bacon was about 5 inches long, rather than the 10 inches that they would be out of the package. Heating the bacon up, the smell of the maple started to come out. It seemed to have been hidden in the meat, or fat, somehow, and wasn’t anywhere near as obvious when the package was opened as it was once the bacon started to heat up! My wife wandered in to the kitchen several times, saying things like “It smells good in here!” Like many other games we play with each other, her wandering in to the kitchen is another one. It’s her way of telling me that she’s hungry, and that she wants to eat. Often that is triggered by the good smells I’m creating (at least, that’s what I hope is going on!). I cooked it slow for Bacon, like I have for previous Bacon Project posts. I cooked it at just under medium (4 out of 10) and covered. I’ve come to find that I really like the extra control over the level of cooking I can give to meat by cooking slowly. The juices and flavors of the meat come out much better if I give it the time to really express itself. That’s especially true with a great bacon! Wow, that maple flavor turned out to be just incredible! It’s not overpowering, more like a great job spicing a shrimp dish. The scent of the maple curled around my nose as I slowly ate the slices of bacon. The smokey smell of maple-smoked meat came through too – and they did a really amazing job! The overall flavor profile was similar to a perfectly ripe avocado: a combination of the sweetness of the ripe fruit and the smokiness of the perfectly aged fats in the body of the fruit. 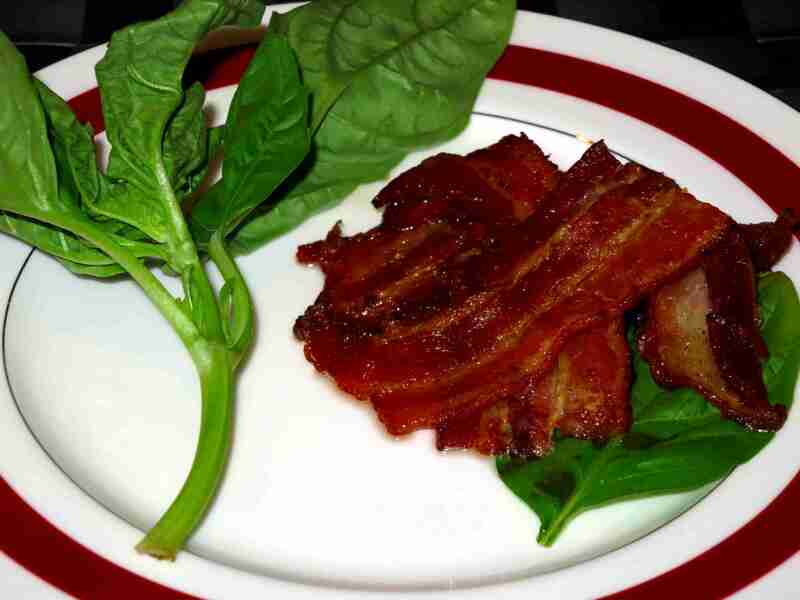 This bacon was just like that: it was a perfectly ripe avocado! Perhaps next time I eat it, I’ll combine it with avocado. I realize that my last Bacon Project post stated that it was the actual ideal of American Style bacon, but it will have to move over. There are now two brands of bacon sharing that crown! As you can see in the picture below: The coloring is perfect! The thick strips of red with the thin strips of white snaking through them – it’s really quite impressive! And it holds up against the green it is plated along with as well, as you can see. This one gets a check-mark for the first three. I have done some research on the fourth point, and can proudly give this a half-check. They don’t tell exactly where the pork is from, so it’s hard to give a full check. But the website does have a full list of the farms that it might be from, and they all seem, on the surface, to be pretty good! But some internet research turns up the regions that the bacon is purchased from (and the package actually says they buy only from VT and Canadian farms) so I can do some further generalized searching to see if there are any CAFO style pork products from those regions, and the result is that there are not. So that is promising, though no guarantee. It’s pretty close though! And finally, where did I buy it? Whole Foods – I picked this up at Whole Foods. I am extremely pleased, and will go so far as to say that this is the best commercial bacon I’ve purchased so far! With that in mind, definitely take a minute and look for this bacon in your local Whole Foods – it’s worth the look!! 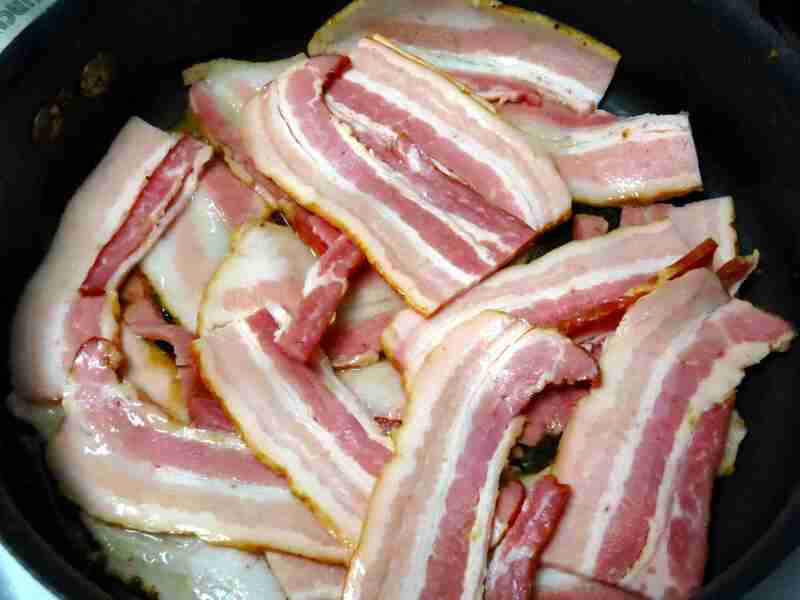 Thanks to Chris Bailey from Vermont Smoke and Cure for his comment on the post with information on Bacon and on their Vermont Smoke and Cure Bacon. “Hello – Thank you for the review! On our web site it explains that the pork for our uncured bacon and ham is all from DuBreton, a great outfit in Canada working with many family farms in their region. Thanks again for reviewing our bacon and for helping spread the word about healthy balanced diets and great tasting food! This is great stuff! And: It’s good to know that the “uncured” label is from USDA, not FDA. Their a little silly with that regulation… But oh well. And It’s amazing to know that they’re using smaller local farms – this validates my half-check above! Small farms typically produce the highest quality meat, which is incredibly important! I was not surprised in the least – or, rather, I was pleasantly surprised when it exceeded my already lofty expectations! As you say, it says Vermont right on the label! Hello – Thank you for the review! Hi Chris – Thanks for writing in and clarifying some of the points in my article! I was astounded by the taste and quality of the bacon (as it says in my post) and would be delighted if you at Vermont Smoke And Cure would like to put together a guest article on the process that you and the team there go through to select and produce the high quality product that you’ve put together. If this is something you would like to consider, send me an email at urbanpaleochef@gmail.com. I would love to hear from you! I’d have to try this brand and see if it’s worthy for 365DaysofBacon.wordpress.com! I recommend it – it could be the best commercial bacon I’ve ever had! I buy from some local farms too, which are obviously as good as it gets, but this is really top quality commercial bacon!